Our customer is a US based international gaming company that provides solutions to regulated and authorized gaming operators and suppliers around the world. Our customer specializes in lottery and other innovative wide-area progressive gaming applications where performance, reliability and high-volume transactions are critical. Our customer has clients in 5 continents and has been extremely successful in the gaming industry. The US gaming industry in general and casinos in particular are experiencing a falloff in revenue. Recent statistics from the Nevada Gaming Control Board show casino revenue on the Las Vegas Strip, the largest gambling spot in the nation, fell to $510 million in January. In Atlantic City, NJ, the next largest gambling destination in the United States, gaming proceeds dropped to $310 million for the month down 20 percent on the tables and 19 percent on the slots, according to the New Jersey Gaming commission. This was a big surprise as this sector has remained largely immune to previous economic downturns. Our customer realized how important it is for gaming industry to maximize the effectiveness of every investment and every project undertaken towards implementing their solution for their authorized gaming operators. One area that our customer identified was the portion of the offline marketing, advertising and communications budget to on-premise promotions. This spend that can have a direct impact on the revenues, and was multiple times lower than the operators traditional advertising and marketing spend. The customer felt, a digital signage solution integrated with their Gaming System would ideally allow the operators to break free from their poor revenue growth, allow them to reduce their traditional advertising and marketing spend and improve effectiveness. Our customer was of the intent to offer digital signage as a platform along with their gaming system. They were keen on promoting digital signage that would take care of the draw / result display, property-wide marketing, advertising and communications needs of operators. SignaVista comes with a powerful central distribution system that allows the gaming operator to define what content goes where, and also define the order and duration of the content. SignaVista has support for all forms of media. 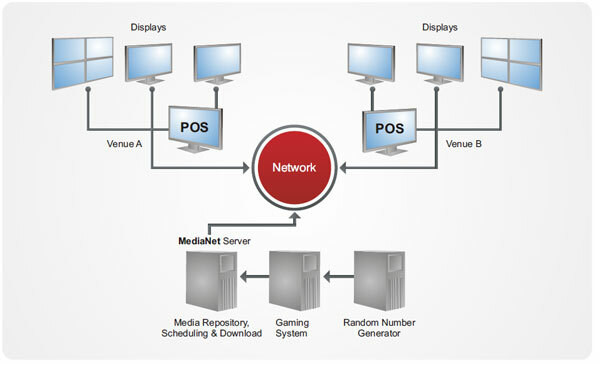 Each display system receives real-time changes to content and schedules, and downloads new content when required. With SignaVista, you simply have to load your new content on the central server and update the display location and schedule parameters via the easy-to-use administration module. If you are using text overlays, such as for jackpot or winner notices, these can be entered directly into the system and take immediate effect at the locations you specify. The customer was able to successfully roll out this solution to their operators in record time. This integrated solution allows our customer to promote this along with their gaming system and infrastructure, to all the operators now. Dusane’s expertise in gaming industry allowed the deployment to be done faster. Dusane continues to improve their SignaVista offering, which will get integrated with our customers’ offering as well.